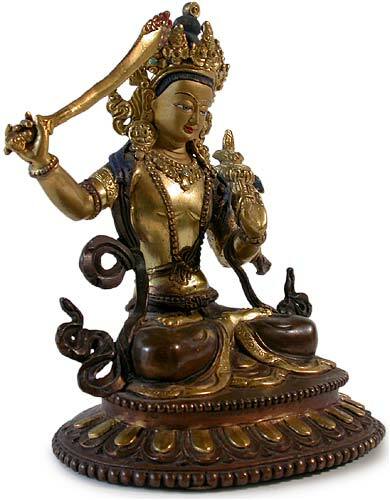 Seated in a diamond position, this sculpture of Manjushri is full of radiance. The face of Manjushri is painted in cold gold. The uppermost gilt hair knot representing vajrasattva, with hair that flows to both sides of the Bodhisattvas' shoulders finely incised and painted in dark blue; on which he is wearing a five pronged crown framing the youthful face of the Bodhisattva of Wisdom. He is steadily gaze downward, with a serene smiling expression. 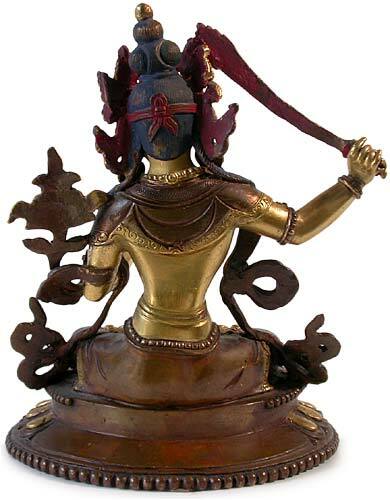 In his extended right hand, he is holding the double edged sword that symbolize elimination of ignorance; his left is gently holding the stem of a lotus that winds over his shoulder, where the Book of Divine Wisdom (Prajnaparamita Sutra) rests in the lotus blossom. 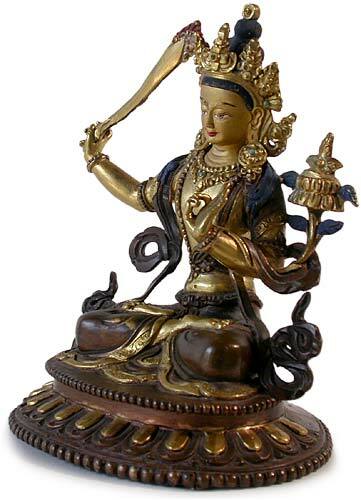 Along with two falling sashes fluttering on either sides, the elongated body of Manjushri sways slightly away from the center. 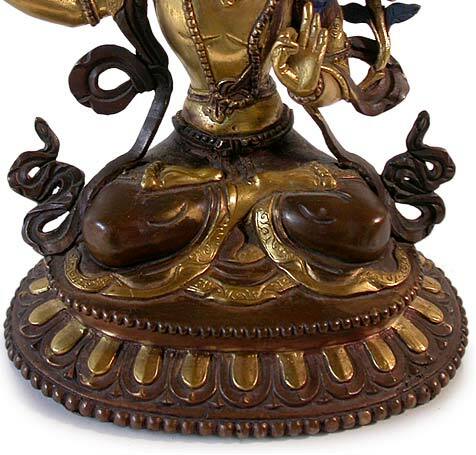 Although the Manjushri Bodhisattva statue is a prototype in accordance with centuries old Tibetan Buddhist traditions, the crisp sharp features of this small statue are an excellent example of the superb Tibetan sculptural technique. The artist demonstrated his technical proficiency with richly gilded gold and copper on a well casted smooth surface. The statue is missing four small turquoise stones though overall in excellent condition.